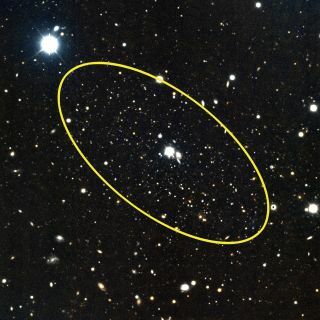 The circled cluster of stars is the dwarf galaxy Andromeda 29. The bright star within the circle is a foreground star within our own Milky Way galaxy. This image was obtained with the Gemini Multi-Object Spectrograph at the Gemini North telescope in Hawaii. Astronomers have found two small galaxies that appear to circle our Milky Way's galactic neighbor Andromeda, and could shed new light on the mystery of dark matter in the universe, scientists say. The newfound dwarf galaxies, called Andromeda 28 and 29, are two of the most distant satellites galaxies from Andromeda ever detected. They are located about 600,000 light-years away from Andromeda, and approximately 1.1 million light-years from Earth, researchers said. The Andromeda galaxy is about 2.5 million light-years away and is the nearest spiral galaxy to the Milky Way. Like our galaxy, Andromeda is surrounded by numerous dwarf satellite galaxies. These newly found dwarf galaxies were discovered using a star-counting technique on the newest data from the Sloan Digital Sky Survey, which has mapped more than a third of the night sky. The research team, led by astronomer Eric Bell of the University of Michigan in Ann Arbor, Mich., also analyzed follow-up observations from the Gemini North Telescope in Hawaii. The Andromeda galaxy is the closest spiral galaxy to Earth beyond our own Milky Way, the researchers said. At 600,000 light-years away from their host galaxy, Andromeda 28 and 29 are also 100,000 times fainter and invisible to the naked eye. Even with large telescopes these dwarf galaxies can barely be seen, the researchers said. "These faint, dwarf, relatively nearby galaxies are a real battleground in trying to understand how dark matter acts at small scales," Bell said in a statement. "The stakes are high." The prevailing hypothesis is that visible galaxies are all nestled in beds of dark matter and each bed contains a galaxy, the researchers said. For a given volume of the universe, the predictions match observations of large galaxies, but there are still some unknowns. "[It] seems to break down when we get to smaller galaxies," said Colin Slater, an astronomy Ph.D. student who worked with Bell on the new study. "The models predict far more dark matter halos than we observe galaxies. We don't know if it's because we're not seeing all of the galaxies or because our predictions are wrong." The results of the study could help astronomers narrow down the search for dark matter. "The exciting answer would be that there just aren't that many dark matter halos," Bell said. "This is part of the grand effort to test that paradigm." The new study will be detailed in the Nov. 20 edition of the Astrophysical Journal Letters.